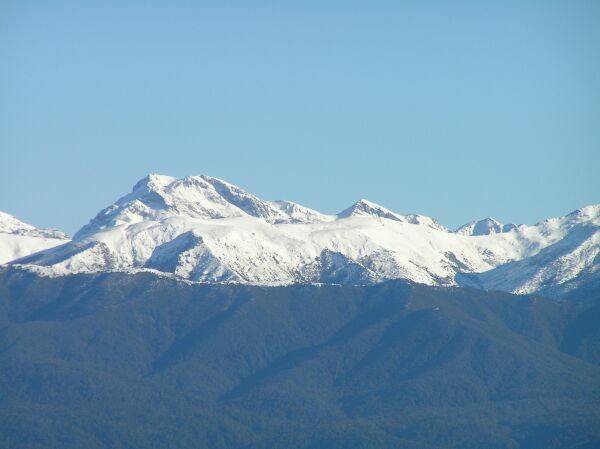 Still a little tired and sleep deprived from the Kaikoura Roots Festival, another high was moving in from the Tasman. Yahoo! Summer has finally arrived! 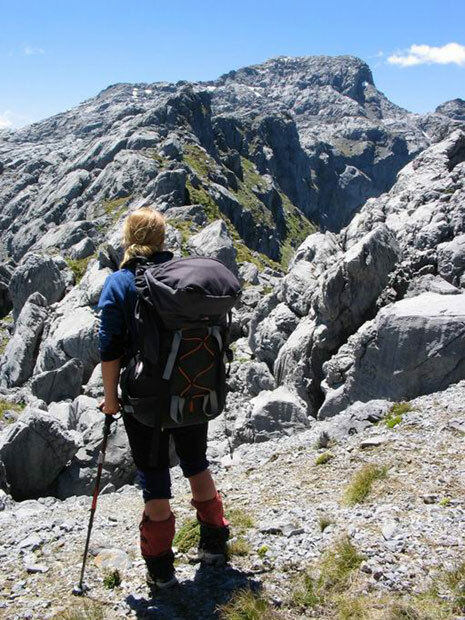 Our intended route for Mt Owen was to climb the south side from Owen Valley East Road and descend down the common northern approach to Courthouse Flat in the Wangapeka valley. We’d heard about it, seen the photos (and the movie!) of the limestone and marble labyrinth of Mt Owen so we were really looking forward to this one. We took a tent so we could camp out amongst this amazing landscape. Peter from Nelson Lakes Shuttles picked us up from Courthouse Flat early on Wednesday morning. The shuttle around to the south side was a bit longer than we thought, over 2 hours. Thanks Peter, we appreciated your help and you certainly earned your dollars that morning! We’d read that the southern approach was slightly more challenging than the northern side, which we felt to be a slight understatement. The track starts with a gentle 3 km stroll up a creek before a 1400m steep climb almost directly up to Sunrise Peak. Above the bushline the route gets even steeper and you definitely want a good head for heights on this section. 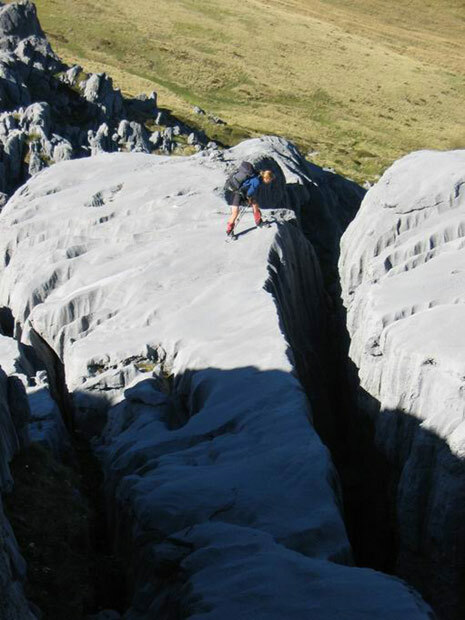 From Sunrise Peak we entered the labyrinth of limestone, a marble glacier straight out of LOTR. Although Mt Owen is less than 2km away as far as the crow flies, it takes awhile negotiating the rock as often you get bluffed out or your path blocked by a crevasse. Its super fun but you have to watch out, as the rock is SHARP. No wonder no one rock climbs up here! Eventually after a few hours of scrambling around and traversing onto the west side, we were up on the summit with no clouds and no wind. 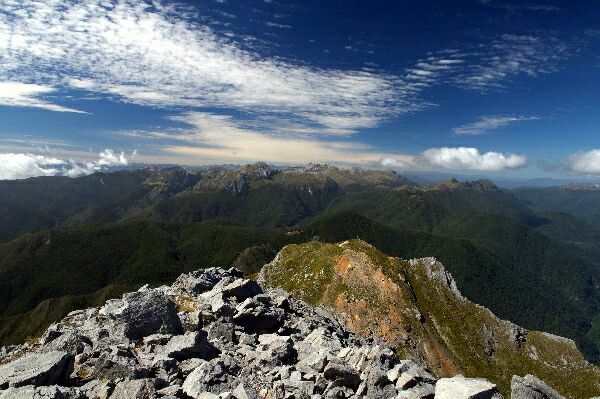 People talk about the views from Mt Owen and we could see why; Tasman Bay, the Richmond Ranges, Nelson Lakes, Murchison, Abel Tasman, and the rugged interior of Kahurangi NP including the most impressive Twins. Wicked! It doesn’t get any better than this! The northern approach was a completely different story, and much to our delight there was a clear path down through the rock glacier and crevasses. We descended down to some tarns below the summit rocks and set up camp for the night. It was just a completely magical place, well worth carrying a tent for. There was no wind so it was just SO quiet; lying in our sleeping bags all we could hear was the ringing of silence. The next morning dawned clear with beautiful light on the summit rocks. After a leisurely breakfast, it was a pleasant stroll down the valley past Granity Pass Hut, Blue Creek and onwards to Courthouse Flat to our waiting car. Mt Owen is an amazing trip, which can be done over a weekend. 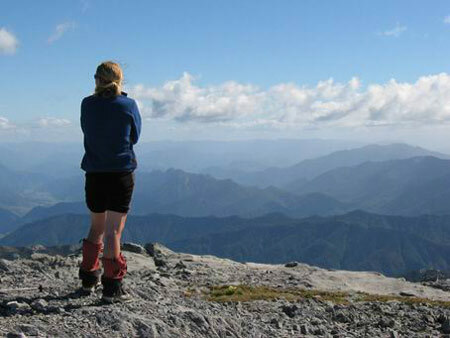 The landscape is unlike anything else in NZ and you definitely want to pick your weather for the incredible views. 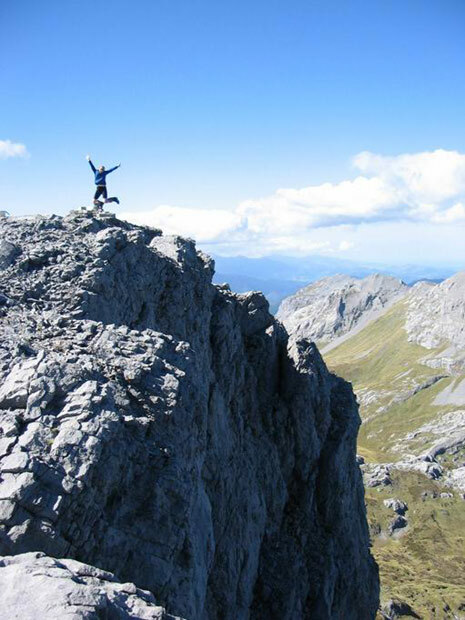 The northern side is a well-formed track right up to the summit, whereas the southern approach is a pick-your-own-way route requiring good weather and patience to find your way through the sharp rock. Either way, a highly recommended adventure!